A Personal Account is only available to UK residents aged 18 or over, and is subject to status. Once you have opened a Personal Account you will be sent a statement each month showing the minimum payment required, and the current outstanding balance. The minimum payment is 5% of your outstanding balance, subject to a £5 minimum. For a fashionable wardrobe and lifestyle too - Look Again! This is where to head to discover a plentiful catalogue that covers those must-have categories to suit different people and lifestyles. For men, women and kids alike - find fashion for every occasion and from the brands you love. With Adidas, French Connection, AX Paris and more on the books - whether you’re shoe shopping for performance trainers, looking for a showstopping evening outfit or simply something to kick about in at home - you’ll find it here. Take yourself to accessories galore, cosmetics and even gaming essentials. When you can shop the latest technology like the Nintendo Switch, alongside your favourite MAC mascara - it’s clear that you can get all of the goods and more that you want in one quick shopping haul when you visit Look Again. What makes this the perfect shopping destination? Here you know that you’re getting great value for money, so you just can’t go wrong. For the home too, find garden goods and everything to make your indoor space homey, modern and comfortable. Don’t wait to get inspired today and to discover the new items incoming on the regular with Look Again. Browse the blog if you need a little guidance from the experts, and whether you’re shopping for yourself or looking to gift another, you’ll stay on budget and find something beyond your expectations with Look Again. How do I use my Look Again offer code? Your discounts will be redeemed and if you didn’t require a code for your chosen offer, your deal will be automatically applied. Open up a Look Again account to help spread the cost of your goods when you indulge in a little retail therapy with your favourite store! What size should I order with Look Again? You can find a size guide for different apparel categories to help you make an informed decision when ordering your items. When is the Look Again sale? You can shop the sale section online for reduced items across many different product types. Can I pay off my Look Again Personal Account with a Direct Debit? Yes, you can head to the ‘My Account’ section to set up a Direct Debit and to never miss a payment again! Parcel shop and other delivery options are available. You have 14 days in which to decide whether you are happy with your products and to request a refund, do check the full policy. Enquiries: 0333 200 8026 8am-11pm, 7 days a week. For affordable fashion and homeware to suit the whole family this year- look no further than Look Again! For all of your style inspiration, this is where you will find a catalogue that’s brimming with dreamy goods. With a Look Again discount code from us, you can save on an array of clothing, jewellery and accessories as well as home appliances, sports goods and much more. Make yourself a style resolution this year at Look Again! 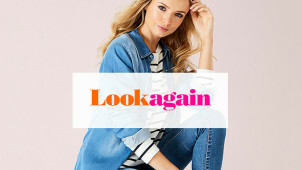 Look Again has a brilliant app available on the Apple store and Google Play so that you can take your dream shopping experience everywhere you go. Benefits include one-tap shopping, easy searching for the latest trends, order tracking and so much more. With the app you can shop securely from your smartphone and even enjoy exclusive savings on a world of fabulous products, so don’t wait to download it today! For an expertly created fashion experience, check out the Look Again fashion picks. With dresses, jackets, jumpsuits and more available - this is where you can find the perfect attire for that weekend away, night out, work meeting or coffee break. With the Look Again voucher codes you can save on apparel for men and kids too. Whether you want to go smart or casual, Look Again will never fail to inspire you with its stylish daily offerings.